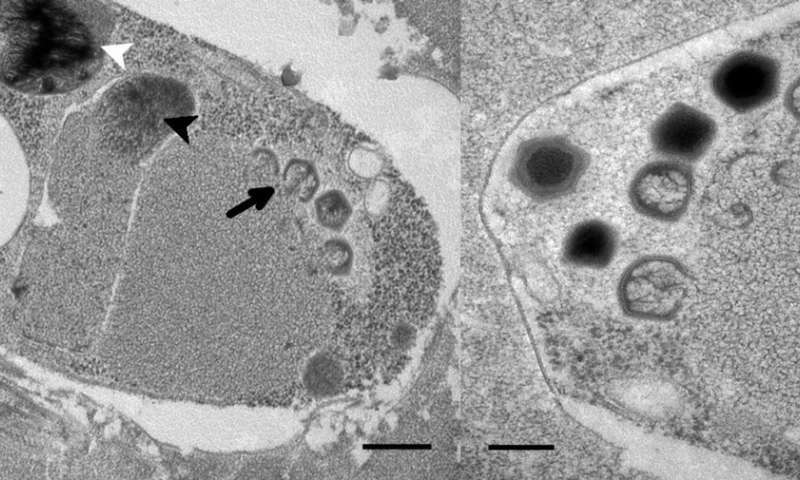 Bodo saltans virus, the first isolated representative of the most abundant giant viruses in the sea, has been unveiled by researchers at the University of British Columbia. The virus, whose genome weighs in at 1.39 million bases of DNA, is one of the largest giant viruses ever isolated, and the largest known to infect zooplankton. "Bodo saltans virus is one of the few giants we've characterized that infects a common and ecologically important host," says University of British Columbia researcher Curtis Suttle. "It's representative of the most abundant giant viruses in the sea, yet until BsV was discovered, there was no way to investigate these viruses in the lab." Because Bodo saltans virus (BsV) has to compete with a multitude of other viruses to infect its plentiful host-a microzooplankton called Bodo saltans-it comes armed to the hilt. It possesses an arsenal of toxins and DNA cutting enzymes, which likely interfere with other viruses trying to replicate inside the host. During infection, BsV maneuvers towards the rear of the host cell and releases its viral genome. It appears that as BsV evolved it stole genetic machinery from the host to help in the infection process. BsV doesn't carry transfer RNA (tRNA), part of the replication machinery all other giant viruses carry. It does, however, carry tRNA repair genes, making it likely that the virus uses the host's own tRNA during infection. Again, these genes appear to have been coopted by the virus directly from the host. Cell of Bodo saltan 24 hours after BsV infection (Left) and BsV virion assembly and maturation (Right). Credit: Christoph Deeg, Curtis Suttle, University of British Columbia. More than 10 per cent of BsV's genome encodes the same group of proteins that are likely involved in combating the host's antiviral system. "These genes are actively being duplicated in an accordion-like mechanism in the periphery of the viral genome," says UBC graduate student Christoph Deeg, first author on the paper. "This suggests that the virus is engaged in an evolutionary arms race with its host, and could offer on explanation of how the genomes of giant viruses could reach their impressive complexity." Giant viruses have much more DNA than typical viruses, enabling them to produce a multitude of proteins that allows them to replicate largely independently of their host. Although researchers knew BsV-like viruses existed based on sequenced environmental DNA, only now has a representative virus been captured and studied in the lab. 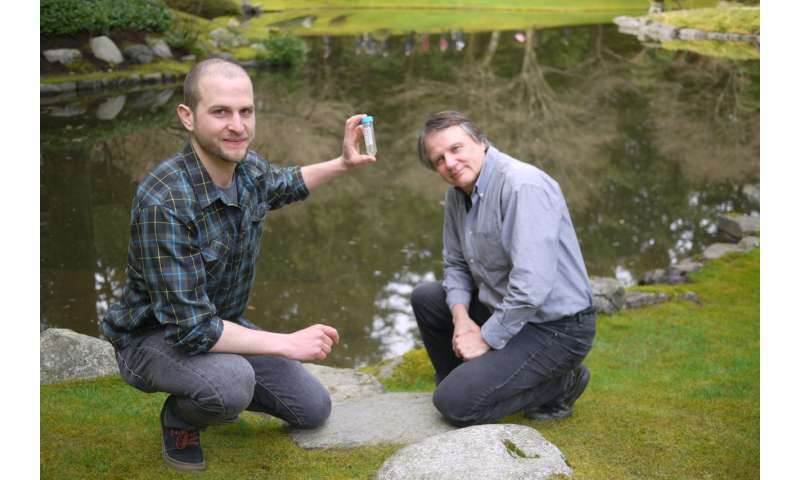 The Bodo saltans virus was isolated in samples from UBC's Nitobe Memorial Garden. The researchers describe it in eLife. Make a Dilute solution of homogenate of a collection of such viruses (has to be pure); Then Inject bit by bit into the cells of host zooplankton to observe for production of any Anti-Viral Particles; Collect them and later on check out the entire process thoroughly ! be, Can you promise (pinkie-ring swear) that your experiments will not result in stronger, more resilient viruses?